Customize the ad experience on your app based on user segments. You can now easily tailor the way you serve your ads to fit a specific audience and better understand the behavior of certain groups of users; thus helping you improve ad implementation and ultimately generate more revenue for you app! 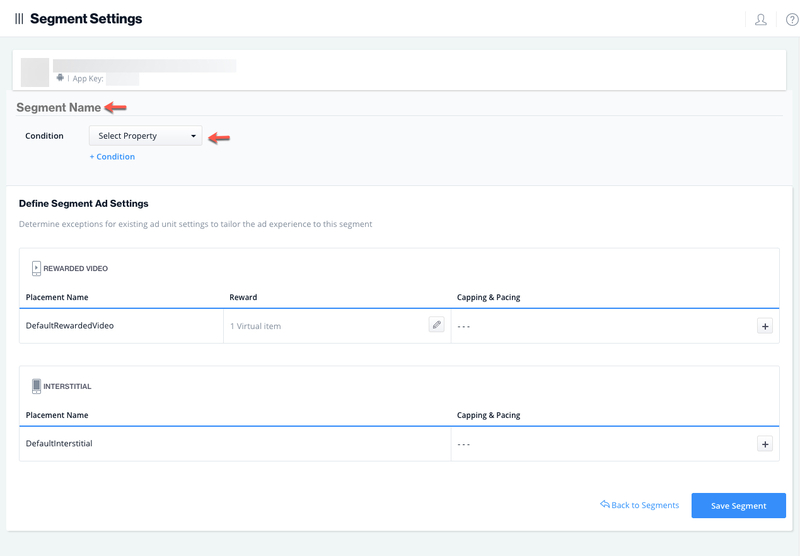 To serve ads based on user segments, you will have to first set up the segment by defining its conditions and your preferred ad settings for the user segment on the ironSource platform and then configure segments in your code by following these instructions. On this page, you will see the existing ad units and placements for your app. Once you define a segment, you will be able to customize the ad settings (i.e. placements, reward, capping, pacing, etc.) for these ad units. Note: You must have configured ad units for the app to define new segments. If you have no ad unit defined yet, go to Ad Units & Placements and get started! You will be directed to the Segment Settings page where you can create segment based on conditions to categorize your users. To begin, name your Segment and choose the conditions a user must meet to belong to this segment. A segment can be comprised of up to 10 conditions. ironSource supports the user properties described below; some of these are collected by the ironSource SDK while others must be sent to our servers through the API. 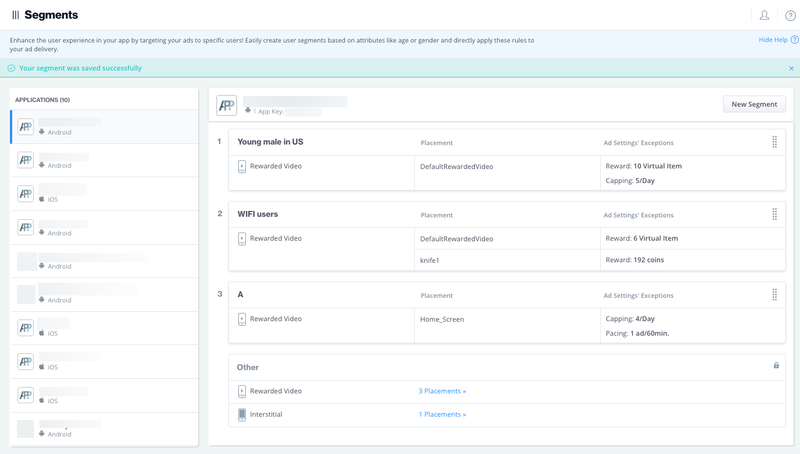 You can also create up to 5 custom user properties and pass them in the API. Follow these instructions on how to inform us of the user’s details. Custom Parameters: Any additional data you’d like to dispatch to our server. 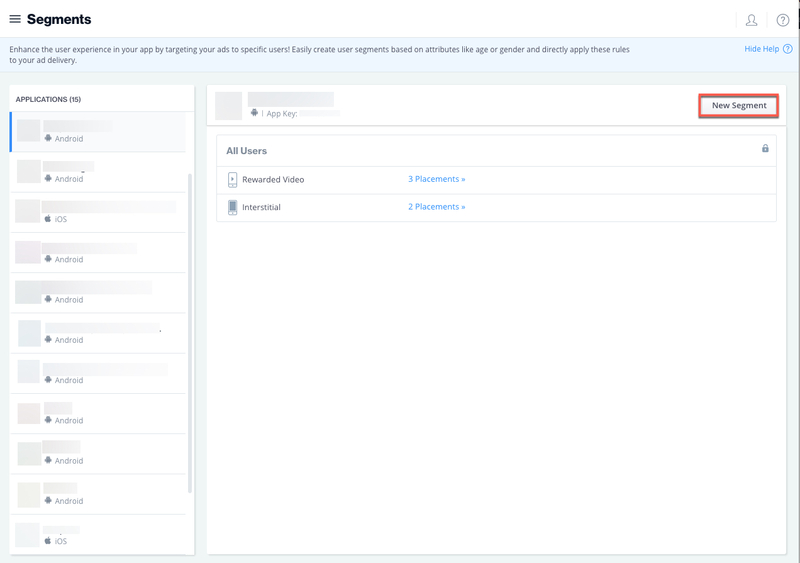 In addition to user and custom properties, you can also set a Custom Segment as a condition and inform us when a user is a part of this segment without providing individual user details. These users will be served ads as defined for the segment on the ironSource platform. Note: When you select ‘Custom Segment’ under Conditions, you will need to enter the identical name of the segment as manifested in the API so we’ll know to recognize the custom segment. Configure the criteria for the condition by selecting the operator (Equals, Less Than, Greater Than, etc.) and enter a correlating value. ironSource supports wildcards for user properties that are of type string. Wildcards are single character placeholders that can be used to stand in for a number of characters in a text value. ironSource supports three standard wildcards: asterisk (*), comma (,) and question mark (?). The ‘*‘ placeholder matches any number of characters and must be placed before or after the value. We do not support consecutive asterisks, i.e. **. The ‘?‘ placeholder matches a single character and can be placed anywhere in the value (before, in the middle or after). We support consecutive question marks to stand in for multiple characters, i.e. c? ?p to represent comp, coup, clip. The ‘,‘ placeholder allows for a list of comma separated values in the string and functions as an OR operator. We support up to 5 comma separated values, i.e. iPhone 4S, iPhone 6, Galaxy S4, Nexus 4, HTC One. To tailor the ad experience for the segment, you’ll need to define exceptions to your existing ad settings. If you choose to keep the Segment Ad Settings as is, you will simply serve ads as configured on the Ad Units page. By adjusting the placement’s ad settings, you are creating an exception to the existing ad settings for this segment. Customize the reward amount per placement. For example, you’d like to grant Women Who Work (female users aged 18-70) with double the usual reward. Limit the amount of ads you serve per placement by adjusting the capping and pacing settings. 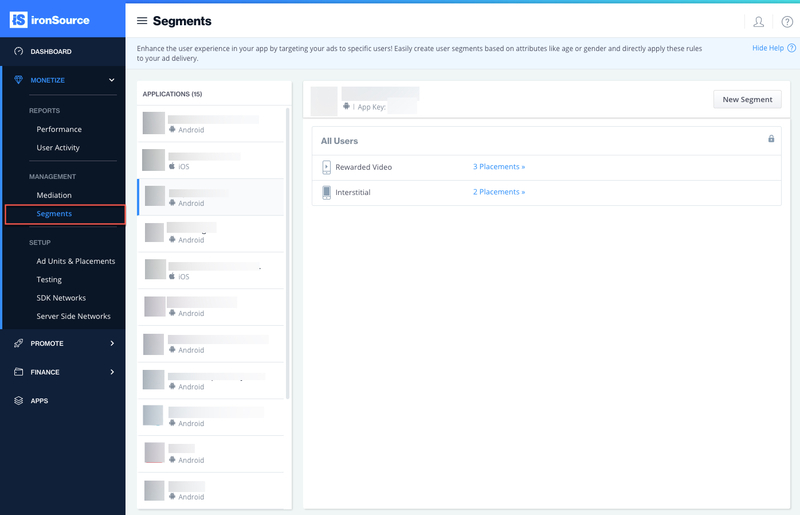 If you’ve correctly set up your segment and customized its ad settings, you will then see the created segment on the Segments page along with a success message. The page shows you the default ad units below the segment details; namely the Segment Name, the relevant placement and the defined exceptions to your existing ad settings. Note: If you choose to leave certain default ad settings untouched, you will not see them in the segments details but they will still be applied for the segment. If you create more than one segment, you can prioritize the ad settings by arranging the segments in the order of your preference. Thus, if you have a user that belongs to two segments, we will ensure to serve the ad with the ad settings from the segment in higher priority. Done! You’ve successfully set up segments to tailor your ad settings to your users.